Doesn't actually grant any legal power, but it is shiny! In the Wild West, sometimes the only difference between a town sheriff and an outlaw was that one carried a badge and a gun, and the other just carried a gun! Most sheriffs actually took a lot of pride in protecting their neighbors. But, if a new gang rode into town, and back-up could be a couple days away, a good lawman may not have been able to afford strictly following the laws they swore to uphold. And if the bad dudes didn't pay attention to a sheriff's authority, that's when things got nasty! Next time you are suiting up in your old western sheriff costume, be sure you pin this Wild West Sheriff Badge on before you ride out. 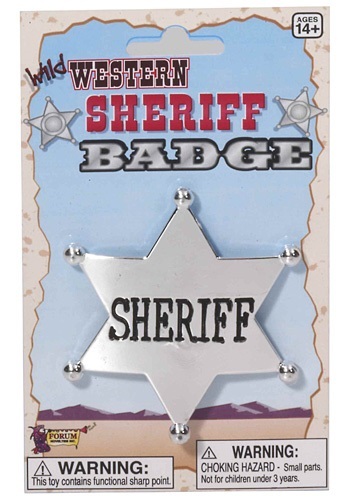 It's just as shiny as the badges carried by sheriffs on the high plains, but no former sheriffs probably had to get bumped off for you to get promoted. You'll want to make sure to bring along a toy six-shooter or two, just in case the badge doesn't work at first.